It's party season! Whether you are headed to someone's home for a get together, or shopping for your sister/friend who loves to entertain, then this guide is for you. I've rounded up some great gifts, all under $60 (with most being under $35). And of course, when all else fails, you can never go wrong with a nice bottle of wine! 1. Pineapple Tumbler: Not only is this super cute, but it's perfect for a party. Put it on a bar cart, or it will look beautiful on the dinner table. 2. Soap Set: I love having pretty soaps in my guest bathroom, and Fresh soaps always smell so good. This set is only $30, and I love that is comes with the lip treatment! 3. Mug: If you're like me, I can never own enough mugs! Cute sayings cheer me up in the morning, and I love when my guests get to use them too. 4. Throw Blanket: Not only does this one look great draped over a chair, but it's super cozy. Perfect for snuggling on the couch on a cold night. Plus it comes in 19 colors, and is under $30! 5. Coasters: For someone who loves to entertain, you can never have enough coasters. I love the sleek look of these brushed copper ones. 6. Candle: Like a nice bottle of wine, you can never go wrong with a candle. Not only do Diptyque candles smell delicious, but they have a luxury feel. 7. The Art of the Bar Cart Book: Coffee table and cook books always make great gifts, and with bar carts being so popular right now, this book is perfect for that cocktail lover. 8. Cheese Plate: Not only is this great for serving, but I love that this one is monogrammed for a more person touch. 9. Cheese Knifes: I love collecting cheese knifes, and these gold plated ones add an elegant feel. These are such perfect hostess gifts! It is so sweet to give something to hostess, because a lot of work goes into holiday parties! Those coasters are so gorgeous. I will definitely be adding these to my shopping list. I'm someone who always loves to get a blanket! Never enough. Great picks Rachael! Fun ideas! I really like the pinapple tumbler! 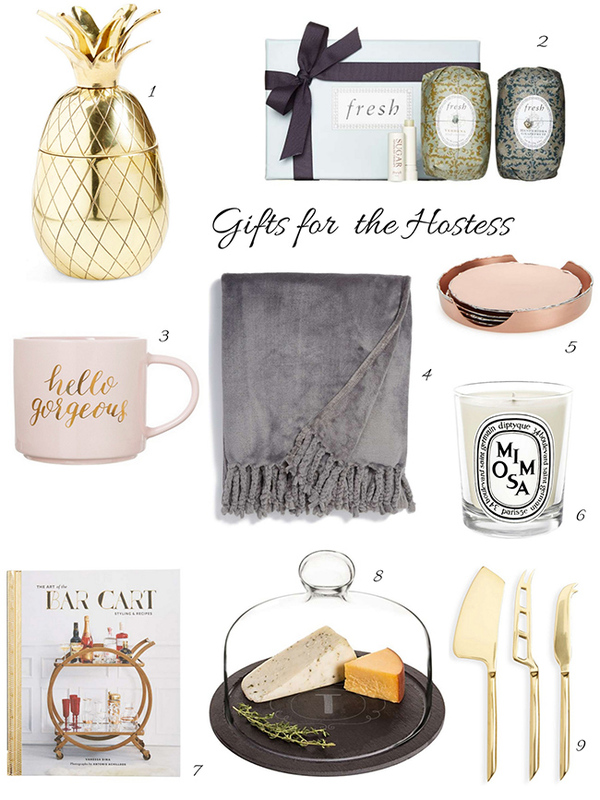 Great gifts ideas for hostess. I love the cheese plate. Love these gift ideas! Need that throw blanket! Great options and lovely post! Lovely picks dear. That Pineapple Tumbler will really make a beautiful dinner table piece.